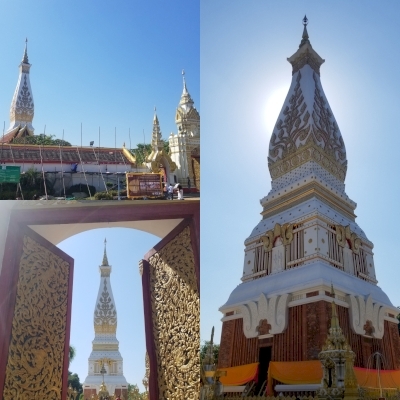 Phra That Phanom, its related historic buildings and associated landscape is part of the Tentative list of Thailand in order to qualify for inclusion in the World Heritage List. Oh my, I dislike religious-based sites so much. So when my friend from Udon Thani wanted to drive here a couple of years ago I only agreed if we stopped at the mushroom-shaped rocks at Phu Phan NP on the way. The drive to Nakhon Phanom takes 3 hours for me, 2 1/2 for her on the way back. At first sight the stupa looks like any other in Thailand. On second sight, it still does. On third, after checking the document now, it's actually rebuilt and looks less interesting. So according to their description this was the first to have this kind of architecture and it inspired the rest of the region - fair enough. That might be something to impact not only Thailand but also Laos across the Mekong. As for the other criteria is is trying to inscribe, literature and all that, I am not familiar with it. It sounds important for Buddhists so I don't want to talk bad about it. I'm going to cut this short now and just say you can save yourself some time not to visit here if you have already seen many stupas around SE Asia. If you are religious then you maybe have a better reason to visit. If you leave early you can pack both this place and the NP into one day and it's kind of entertaining.